The new mid width JK front winch bumper has arrived! The new Hyline Offroad mid-width front bumper is designed with a fully recessed, fully integrated winch plate and is about 6” shorter on it’s overall width than a full size bumper. The recessed winch plate keeps your radiator free and clear to allow adequate airflow. It is designed for the everyday Jeep enthusiast that enjoys the mid width style, but also stands up to anything the toughest trail can throw at it. 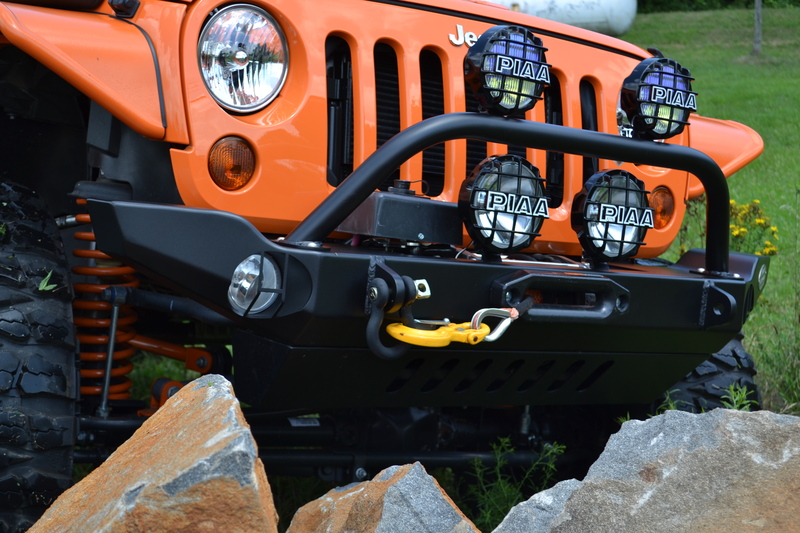 The bumper incorporates factory fog light cutouts and mounts, as well as integrated tabs to mount aftermarket fog/driving lamps, fully welded shackle mounts, an integrated recessed winch plate, and the option to install our Air Dam Skid Plate and/or our Tube Winch Guard. Another great feature, which is not common with all bumpers, is that you can mount your winch after the bumper is installed on the Jeep. 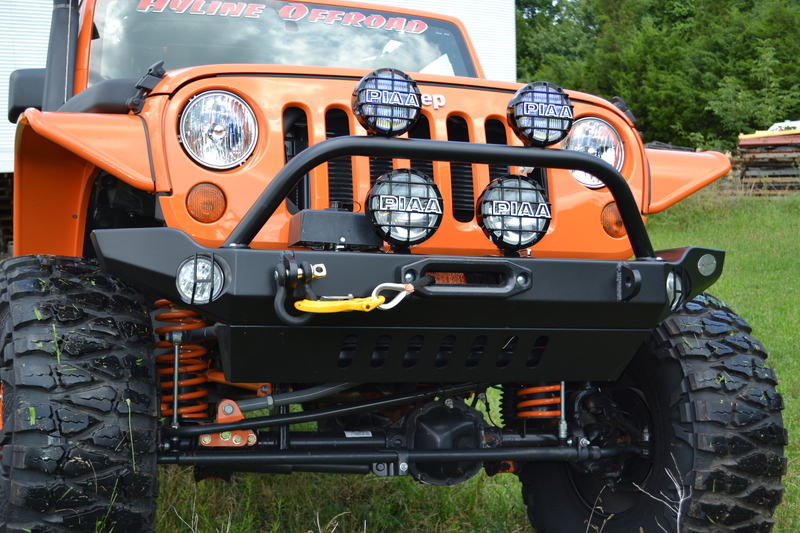 If you will not be running a winch right away our bumper kit includes a winch delete plate. The plate is flat and fills the void of where the winch would be and can be easily bolted on and off. This heavy-duty bumper is fabricated using USA Grade 3/16” Steel Plate, laser cut, CNC formed, robotically welded, and hand finished by craftsmen. The D-Ring mounts are 5/8” Thick Plate and welded solid front and back so they can be used as recovery points. All JK Front Bumpers receive a thorough zinc phosphate rinse and cleaning, then are E-Coated and Powder Coated with a lightly textured black finish. Our unique textured finish is easy to clean and matches almost perfectly to the black factory fender flares. This bumper is completely Bolt on, No Drilling Required. *On 2012+ model Wranglers, a vacuum canister relocation kit may be needed, depending on the size of your winch. Front winch bumper, winch mount plate, fully welded D-Ring mounts (3/4" shackles with 7/8" pins not included) mounting brackets and all required Grade 8 mounting hardware.